• It was quickly pointed out that the four teams still alive in the playoffs just happen to be the top four offenses in the NFL in 2018. While that may be true, it was the traditional formula of running and defense that ruled the weekend. In the Chiefs’ win over Indianapolis, Damien Williams rushed for 129 yards while Patrick Mahomes had a rare sub-300-yard passing day. The Rams had two 100-yard rushers and held Ezekiel Elliott to 47 yards. Sony Michel rushed for 129 yards and three touchdowns for the Patriots, who held the Chargers to seven points in the first half. The Saints outrushed Philadelphia 137-49 and shutout the Eagles for the last 49 minutes of their game. • Sean Payton is fearless. His two biggest playoff wins have included bold special teams plays: the fake punt in Sunday’s win over Philly, and the onside kick at the start of the second half that led to a win over the Colts in Super Bowl XLIV. • When is the last time we had both conference championship games feature teams that played each other during the regular season’? New England beat the Chiefs in Week 6; New Orleans beat the Rams in Week 9. • Both conference title games will feature Northern California QBs (Tom Brady, Jared Goff) vs. Texas QBs (Patrick Mahomes, Drew Brees). • On the day that Heisman Trophy winner and baseball draftee Kyler Murray must decide if he wants to enter the NFL Draft, it’s worth noting the baseball connection for three of the quarterbacks playing next weekend: While Mahomes and Goff are both sons of major league baseball players, Brady was drafted by the Montreal Expos. • Some people still believe it’s not a wise move to use a first-round draft pick on a running back, but that line of thinking has been dispelled in recent years. Helping the case for first-round RBs: The Patriots, Saints and Rams all have running backs that were drafted in Round 1. 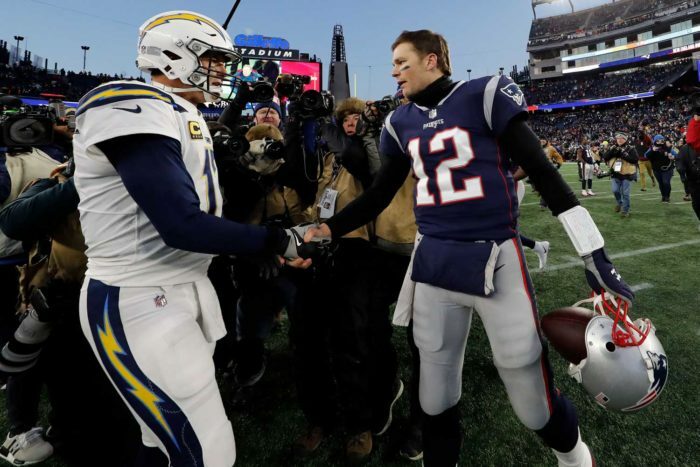 • When New England won the coin toss in their game against the chargers on Sunday, the Patriots elected to receive. That is very rare for a Bill Belichick-coached team. Obviously, Belichick knew what he was doing, as his team marched right down the field for a score. • The drive of the weekend was the Saints’ go-ahead scoring drive in the third quarter against the Eagles. New Orleans went 92 yards on 18 plays, taking 11:29 off the clock. But it wasn’t the only long drive of the weekend. The Patriots and Rams also had multiple long drives to help them advance.